The lodge was consecrated on the 16th November 1963 with an Erection and Consecration Dinner, not in the Seafield Hall where the masonic meetings were to be held but in the Whitburn Miners Welfare Hall in anticipation of the enormous turnout. There was great celebrations as brethren and lodges form far-a-field came to commemorate the great occasion with the founder members of Lodge Lord Bruce 1601 in full attendance the new lodge office bearers and all distingushed brethren at that time. This according to the minute book and and from brethren who took part, a great occasion for freemasonary in Blackburn and Seafield area. As one of the great characters in the lodge at that time Bro Harry Reid the lodge Tyler said: "It' wis a nicht nain o us will ever forget"
The Lodge prospered and brethren worked extremely hard, then due to letting problems at the Seafield Hall the brethren decided to look for premises of their own The brethren had looked at the Co-operative Building in Blackburn a few years before this. But due to various circumstances decided to wait, as at that time the Seafield Hall was fulfillng their needs. In 1975 Lindsay Hall Blackburn was on sale from the Church of Scotland Blackburn and the lodge became very interested. We must at this time thank the Church of Scotland for their generous allowance i.e. £15,000 and if paid within ten years there would be no interest charged to the Lodge. This gave the brethren encouragement to go ahead with the purchase and duly did so. 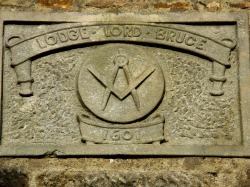 We would like to add at this time that the Church of Scotland Blackburn foundation stone was laid by Dr, Kirk, Provincial Grand Master of Linlithgowshire on 10th November 1907 and so it is fitting that Lodge Lord Bruce now holds the title deeds for the former Lindsay Hall. Since the purchase of the Lindsay Hall, now the Masonic Temple a number of changes have taken place, namely the main building has been cleared out and is now the Temple other changes that have been made a New Lounge, Games Room, Toilets, Kitchen, recarpeted and decorated. This is a great achievment by the brethren and must surely, to all, enjoy the changes to the betterment of the premises.